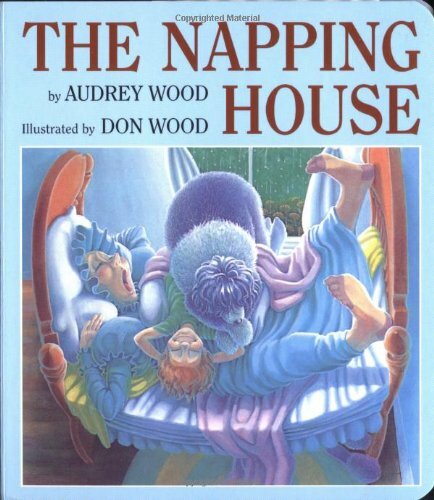 The Napping House was written and illustrated by husband and wife team Audrey and Don Wood. Originally published and named an ALA Notable book in 1984, this cumulative rhyme is toddler and preschool favorite. The text is catchy and repetitive “And on that granny / there is a child / a dreaming child / on a snoring granny / on a cozy bed / in a napping house, / where everyone is sleeping” making this book an entertaining read. However, I think the illustrations make the story even more enjoyable, especially for youngsters. My four year old son's favorite part is when the bed breaks at the end. He always stops me and wants to find where the bed has broken in the picture. Personally, I don't know how anyone naps in that house, but it's a great, great classic book!